The Children’s Miracle Network, or CMN, is a national organization founded in 1983 with two guiding principles: to raise funds and awareness for local children’s hospitals, and to devote these funds to the children’s hospitals for which they were raised. Today, there are 170 CMN Hospitals and affiliate hospitals nationally. Launching in 1985, UF Health Shands Children’s Hospital was one of the first hospitals in Florida to be affiliated with CMN Hospitals. Gerry Schiebler, M.D., who was chair of the Department of Pediatrics at that time, acquired territory for a large part of the state of Florida after other children’s hospitals did not express an interest in being involved. Those original territories spanned South Georgia, Tallahassee, Jacksonville, Orlando and West Palm Beach. Over time, those territories have been divided to support more local hospitals. Currently, the territory for UF Health Shands Children’s Hospital includes South Georgia, Tallahassee, Gainesville and West Palm Beach. In its first year as a CMN Hospital in 1985, UF Health Shands Children’s Hospital raised $119,314. The primary method of funding at that time was an annual Telethon. In recent years our CMN Hospitals program has seen unprecedented growth and is positioned as one of the top CMN Hospitals in the nation. Over the past five years, total funds raised through our CMN program have increased dramatically: from $3,785,086 in FY13 to $8,063,053 in FY16. In FY17, it is projected that we will raise more than $9M. At the conclusion of FY18, we will eclipse $100 million raised for UF Health Shands Children’s Hospital by our CMN program. Indeed, our CMN Hospitals program was recently recognized as the top hospital for total dollars raised in the southeast region and for total increase in funds raised year-over-year. Across the entire national network, only one hospital showed a greater increase in total dollars raised. These funds, along with other investments in our children’s hospital and Department of Pediatrics, have elevated the stature of the UF Health Shands Children’s Hospital and fostered significant recognition of its people and its programs. Support and growth of CMN funds have directly influenced extensive construction and renovation in pediatric areas, as well as recruitment and support of pediatric faculty. Specifically, CMN Hospitals funding has been vital to sustaining projects like the renovations of the Immunocompromised Unit, the PICU, the PCICU, the ER, the NICU and the Surgery Center as well as supporting upcoming projects, including the Infusion Center. CMN Hospital funds also have been used to benefit programs such as Child Life and Guest Services and to purchase equipment like echocardiograms, monitors and sleeper sofas. These funds have supported vital capital projects, and they have supported the ongoing research of many UF faculty members, including seed funds to obtain preliminary data and pilot-test hypotheses. These data are then used by faculty to secure external funding for their research. Funds raised each year come from a variety of sources, including a long list of corporate partners, dance marathons, local events and individual contributions. Corporate partner funds are typically raised one dollar at a time at the register when customers check out and add a donation to their bill. The Publix campaign is running from now until July 1. Dairy Queen Miracle Treat Day (July 27) and Walmart/Sam’s Club (Aug. 28 – Oct. 1) are coming soon. Please join us in donating, thanking and celebrating those locations that are raising funds for CMN Hospitals during this time. A major part of the CMN program is “Dance Marathon” (see On the Same Page from April 11, 2012). 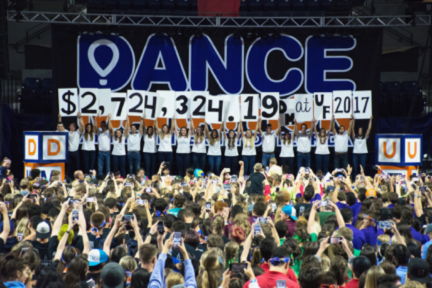 As one of the founding CMN dance marathon programs, we are proud to have two of the nation’s top five dance marathon programs (Dance Marathon at the University of Florida, No. 2; Florida State University, No. 4) and the fastest-growing Dance Marathon in the Southeast (Owlthon at Florida Atlantic University). Since 1995, Dance Marathon has involved nearly 32,000 student leaders. Collectively their efforts have raised $25,541,076 for CMN Hospitals at UF Health Shands Children’s Hospital. Dance Marathon isn’t just about dancing, but developing the next generation of leaders and enhancing all elements of their skills to make them effective leaders post-graduation. Dance marathon events are the culmination of yearlong fundraising, campus engagement and community events and support. Additional support comes from generous community members who sit on the Children’s Miracle Network Leadership Council to provide advice, oversight and connections to the community. The Leadership Council has helped to spur longtime support and engagement with Nextran Trucking Centers, Gator Domino’s, CAMPUS USA, the University of Florida Athletic Association, InterMed Group and Tyler’s Hope, and FrontStreet, as well as private support from Rosemary and Lou Oberndorf. The faculty and staff of UF Health have taken ownership of our CMN Hospital program, providing increased engagement from all levels within our hospital. Events like Celebrity Waiter Night, which was a staple for employees for the past 31 years, raised $3,798,053 for CMN Hospitals. Fishing For Kids, also an employee-led initiative, has been going on for the last 13 years and has raised $168,874. The faculty and staff engagement has also spurred the involvement of many grateful pediatric patients. Currently, nearly 125 patients serve as local Ambassadors for Children’s Miracle Network Hospitals. This not only serves as a way to steward our many community partners, but also provides a healing network of patients and families who have triumphed through similar health challenges. Our ambassador children are often featured in marketing events across the nation to underscore CMN Hospitals’ need for charitable donations. Of course, the extraordinary success of the CMN at UF Health could not have been accomplished without the commitment and dedicated efforts of the CMN staff. Mary Ann Kiely, UF Health’s chief development officer, is the primary point of contact with the national office for the overall goals, partnership agreements and territory alignment. Heather Mears, senior director of program management, works with Matt Romkey, director of CMN, to define the multi-year strategic plan for CMN at UF Health Shands Children’s Hospital. This role includes ensuring the CMN program is operating effectively, maximizing overall return on investment, and aligning the fundraising priorities with the strategic priorities and initiatives of UF Health Shands Children’s Hospital and the UF College of Medicine Department of Pediatrics. Matt also works collaboratively with UF Health’s development and other CMN staff to implement the strategy on a daily basis with their local partners, programs and events. Specifically, Stephanie Nicholas manages corporate partners, Dance Marathon and media outreach efforts in the Tallahassee and south Georgia area. Lindsay Ritenbaugh oversees strategic student and peer-to-peer engagement opportunities across Florida and the day-to-day partnership with Dance Marathon at UF in addition to the Festival of Trees community event. Clare Scheller works to engage CMN corporate partners in the greater Gainesville area. Katie Mogell coordinates CMN fundraising efforts in South Florida and Palm Beach relating to corporate partner engagement and dance marathon growth. Jessica Clayton oversees CMN community events, including Fishing for Kids and the Celebrity Gridiron Challenge. Lastly, Amber Ferrell works with faculty and staff for Ambassador Family referrals and provides experiential tours for donors. P.S. : Remember, the Publix campaign is going on right now. Please consider making a donation when you pay for your groceries.